Black Friday made its way across the pond to the British high street in 2010, bringing with it huge discounts, long queues and even the odd fisticuffs over the last TV. But does this bumper discount day (or days as it has now come to be) have any effect on attention to advertising? Attention to advertising is often secondary: people primarily read newspapers for the news. Ads are commonly ignored by readers, and dwell times are typically very low. In fact, 25% of exposures in print are ignored altogether, with those seen keeping people interested for a mere 2.2”. Digital ads fair even worse: only 35% are noticed for less than a second on average. Hang on a minute though – on Black Friday, aren’t people on the hunt for deals? Don’t they want to look at ads to find that bargain plasma TV? Surely, if they were going to look at ads, Black Friday would be the perfect time? 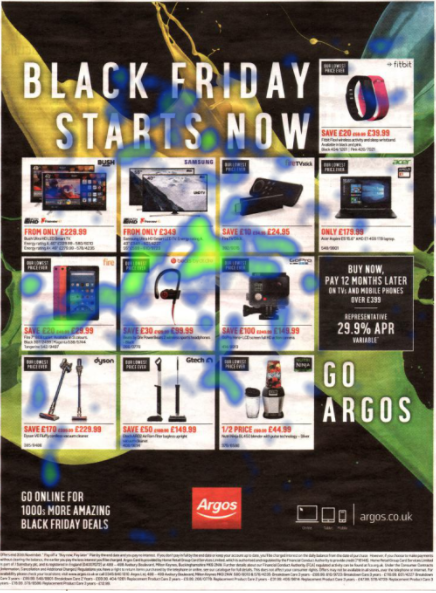 Over the last few years we have collected tons of data on consumers’ behaviour around Black Friday and found just that: the way people look at ads changes on Black Friday. On Black Friday, consumers are on the search for deals, and are actively looking for advertising to help give them information on these offers. This leads to a Black Friday Attention Premium: greater standout and higher engagement with ads. So, as an advertiser, how can I make this extra attention work for me? First things first, join in! We have found that ads that mention Black Friday, do even better than those that don’t. Going all out on a Black Friday template, with Black Friday in the headline can lead to a 20% uplift in attention. Debenhams is an excellent example of this, and has been our Black Friday winner for 2 years running! Secondly, take advantage of the change in consumer behaviour. Usually, we find less is more: ads that look like a poster work harder at grabbing attention because people don’t have time to look for long. Black Friday is an exception: with consumers willingly searching out adverts for information, creating ads in a catalogue style can help consumers easily compare offers, whilst simultaneously boosting attention to your ad. Argos is a successful example of this, by creating a catalogue ad on Black Friday they increased engagement by almost 80%! Every year, Black Friday is becoming a bigger part of the consumer retail calendar. With this comes extra attention to advertising. So why not join the Black Friday fun? 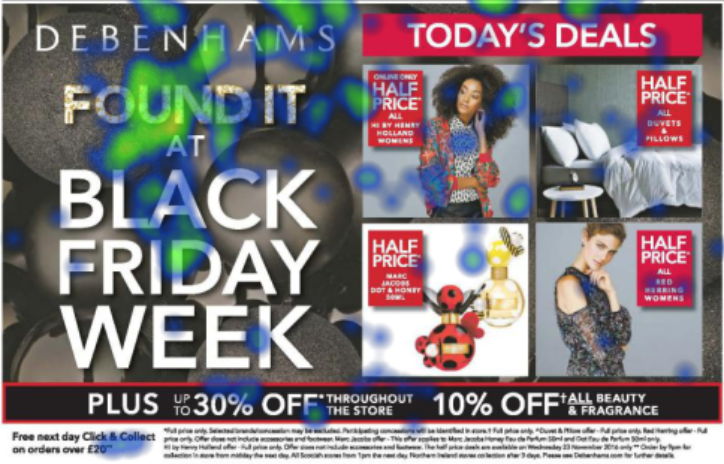 Want to test your Black Friday ads?